FREE SHIPPING! 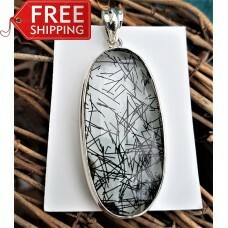 Stunning pendant comprising a large oval piece of faceted tourmalinated quartz. This semi=precious stone is sometimes called rutilated quartz- the rutiles being the black needle like shaped crystals inside the quartz. The pendant measures 60 mm in length, including the bail and 24 mm width. The pendant will be sent in a small gift box . The item will be sent 1st class Royal Mail. Would you like your item with a gift wrap set? The postage on the gift wrap will be refun..
FREE SHIPPING! Stunning earrings comprising oval faceted amethyst and triangular lemon qu.. 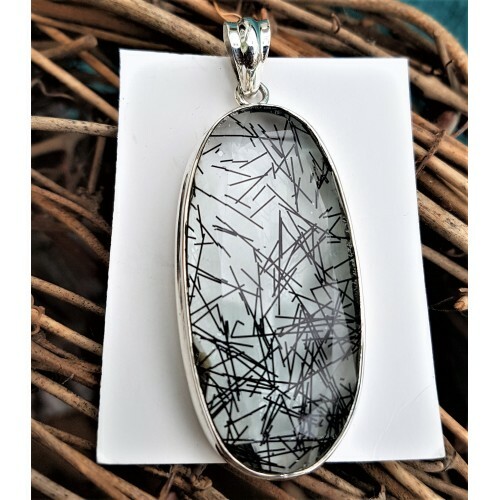 Tags: stunning, large, tourmalinated, quartz, pendant, sterling, silver, pendants new, items, stock!